The 35th Infantry Regiment Association salutes our fallen brother, SFC Dale Franklin Rollins, who died in the service of his country on November 13th, 1968 in Pleiku, Vietnam. The cause of death was listed as Small Arms/AW. At the time of his death Dale was 32 years of age. He was from St. Ignatius, Montana. The decorations earned by SFC Dale Franklin Rollins include: the Combat Infantryman Badge, the Distinguished Service Cross, the Bronze Star, the Purple Heart, the National Defense Service Medal, the Vietnam Service Medal, the Vietnam Campaign Medal and the Vietnam Cross of Gallantry with Palm Unit Citation. 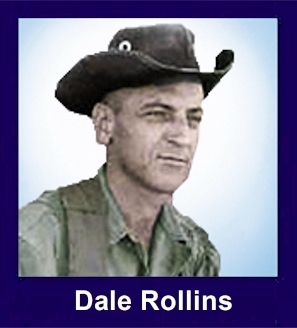 For extraordinary heroism in connection with military operations involving conflict with an armed hostile force in the Republic of Vietnam: Sergeant First Class Rollins distinguished himself by exceptionally valorous actions on 13 November 1968 as first sergeant of an infantry company at Fire Base Vera. When his unit came under an intense enemy mortar and rocket attack, Sergeant Rollins unhesitatingly left the safety of the command bunker and moved through the hostile barrage to check the bunker line and render aid and encouragement to the wounded. Finding a critically injured officer, he treated the man's wounds and had him taken to the helicopter pad for immediate evacuation. He next went to a section of the perimeter which was receiving heavy small arms and grenade fire. When he arrived he spotted and killed a North Vietnamese soldier who had breached the perimeter. After warning the bunker line that the aggressors bad broken through the defensive wire, he spotted four more enemy troops. Alerting a fellow soldier to their location, Sergeant Rollins approached and spoke to them In Vietnamese. Confused by his action, the communists exposed themselves and were killed by him and his comrade. One of the enemy who had crossed the perimeter opened fire from the rear, mortally wounding Sergeant Rollins. Sergeant First Class Rollins' extraordinary heroism and devotion to duty, at the cost of his life, were in keeping with the highest traditions of the military service and reflect great credit upon himself, his unit, and the United States Army. Authority: By direction of the President, under the provisions of the Act of Congress; approved 25 July 1963. LZ Vera was one of the many fire bases built by American Soldiers in Vietnam. They each had a particular reason for being built. Some were on hill tops and others were placed in the middle of no where to block enemy approaches. LZ Vera fit the last category. LZ Vera was in the middle of open terrain surrounded by trees. A Company 1/35th was the unit responsible for building the fire base. The fire base was named after the wife of the First Sergeant of the company, First Sergeant Kahn Carley. It started out as a company firebase but within a couple of weeks, it became a Battalion FireBase with a 155 battery in support. The unit had been in position for almost three weeks. The Company Commander from Company A decided to send out a five-man patrol. In order to provide security for the patrol, the five team-members were made part of a platoon size element. When the platoon reached the wood line, the platoon took a break and the five team-members slipped into the security of the woods. The platoon moved out and left the five men, who would be providing reconnaissance for the company for the next five days, alone. When the patrol returned to the company, they informed the company commander that there was a lot of enemy activity in the vicinity and that the enemy had built a platform in the trees 2,000 meters from the company perimeter to overlook the company operations. The company commander called brigade on the secure radio and he was informed that the battalion would be lifted from the firebase to reinforce the units that were going to be attached North of LZ Vera, according to the information that the Brigade had received. First Sergeant Carly had less then a week to do in country so the decision was made that he would leave when the evacuation of the 3/8th started. SFC Rollins, the First Platoon Sergeant, was made the First Sergeant. When the battalion was lifted out, A Company was the sole element guarding the battalion perimeter. Twenty five to thirty yards separated the company positions. As the sun went down and darkness overtook the perimeter, the company commander issued the order that each position would have three personnel and that two would remain alert and one would sleep. The clay more mines had been camouflaged to prevent detection from the wood line and the barbed wire had the trip flares woven into each other and placed in the middle of the concertina wire. The machine guns and the 106 recoilless rifle were moved into position after dark. The soldiers were told that if they spotted movement the only weapon to be fired was the M79. Around 2200 hours the company commander left the CP and made a round of the perimeter. All of the men were in position and alert. The Weapons platoon had illumination rounds readily available and the 155 SP's were ready should anything start. At midnight, SFC Rollins, the First Sergeant, left the CP to make a round of the perimeter. He called the company commander shortly after midnight. He said, "I am at the North West end of the perimeter with the 106 RR. Everything looks ready should anything start." The company commander said, "Come on back and I'll see you when you return." The Company Commander decided to lay on the bunk and catch forty winks. He thought about all of the things that needed to be done and about the information that his patrol had given him. Will the enemy attack? How big will the force be? He thought about his men and knew that they were a good outfit. After all, they were the Fighting Gypsies. He was just about to fall asleep when the first of the trip flares went off. The Mortar Platoon reacted and fired the illumination rounds. The enemy had zeroed in the mortars and enemy HE rounds began to fall into the mortar pit. The commander told the unit to disregard firing. Spooky was called and the 155 SP Battery responded. The men on the line opened up with their individual weapons and the firefight was on. A young Sergeant from the first platoon reported to the company commander that his platoon leader had been wounded. The company commander told him he since he was the ranking man that he was now the platoon leader. The company commander had heard that the battery commander had also been wounded, so he sent the Forward Observer to the Battery CP. He told the lieutenant that if he saw that he was the ranking officer he would now be the battery commander. When the FO returned he said that the FDC Lieutenant was also wounded but that he was able to function as the battery commander. The FO felt that he could best serve the unit by relaying information to him. The Sergeant from the first platoon returned and said that three Sappers had penetrated the wire and he thought that one was still alive. The company commander left the CP and went to the location where the Sappers were laying. All three were side by side. The company commander shined the light on the Sapper on the left and he was dead. He shined the light on the one on the right and he was dead. When he shined the light on the one in the center, the eyelids moved. Without hesitation the Company commander released the safety of his weapon, kicked the enemy on the thigh just below his family jewels and shouted "Chi Hoi Chi Hoi". (Surrender, Surrender) The Sapper looked like a Ghost. His face was ashen and his body was covered with blood. He still had grenades hanging from his body. He moved to a sitting position with his arms held over his head. The Sergeant quickly removed all of the ammunition and the Sapper was moved to the edge of the 155 SP perimeter. A Helicopter was requested and the Sapper was kept under observation. The night sky continued to be filled with Spooky, Bombs and Flares and the bullets that were fired by the men of Company A. When the Company Commander returned to the CP, SFC Rollins still had not returned. It was strange that no radio messages were received from SFC Rollins. When the sun began to creep over the Horizon, the enemy fire stopped and the company began to take toll of what had occurred. It was then learned that when the three Sappers started to breach the perimeter it was SFC Rollins who discovered them and engaged them. He had killed two enemy and wounded the third. SFC Rollins was found on a pile of sand bags with his weapon empty. He had given his life to save the company. If it had not been for the actions of SFC Rollins, the Sappers would have penetrated the Company perimeter and the outcome of the battle would have been much different. The Sapper that was taken prisoner never made it to base camp. The helicopter did pick him up, but the story goes that the Sapper died and he was pushed out of the helicopter. When a search outside of the of the perimeter was made, the remains of five Sappers were found in the wire. The ninth was found in the latrine area. He was discovered when a young soldier went to the latrine for his morning constitutional. The company commander was called and he shouted "Chi Hoi" as he approached the latrine. An AK 47 appeared around the side of the latrine. The company commander pulled the pin on a grenade, released the handle and waited two seconds before dropping the grenade into the latrine. A soldier moved around the front of the latrine and the Sapper expired. A patrol was sent to check the area and there were blood trails all over the area. It is hard to say how many attacked that night, but the company held. The Fighting Gypsies had made the name of LZ Vera proud.